Advertiser.ie - Fantastic news for their members!! The Connect Card is finally here. As a Credit Union, we are constantly innovating & looking for new ways to collaborate with our community. We are working with new partners for our Members benefit & as part of that we are excited to introduce our new member discount card – The Connect Card. 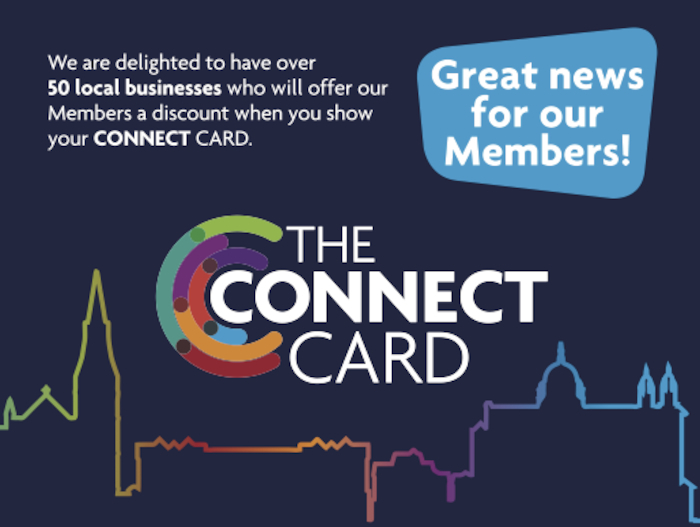 The Connect Card is our Member’s membership card which has been given a new design to reflect that it now doubles as a discount card. Over 50 Galway businesses have now joined The Connect Card to offer our members fantastic savings. The Connect Card idea initially stemmed from Niall McNelis. He proposed this new idea & from that we have created a business community around St. Anthony’s & Claddagh Credit Union that covers the city. The businesses involved are offering discounts to any St. Anthony’s & Claddagh Credit Union Member showing their Connect Card. This is a great benefit for our Members & also the participating businesses. With a membership of over 40,000 people & a monthly footfall in our city branches of 21,000 people that’s a great benefit to a huge number of people & businesses. The Latin Quarter, The Galway City Business Association, The Westend & The Village Salthill – have all joined us for this member discount card & we are proud to have launched The Connect Card in collaboration with these great Business Associations. We feel that by working together on the Connect Card, all involved will benefit. It’s the start of a great offering & look forward to developing it further & working with more businesses. If any Galway businesses would like to join our Connect Community they can contact Lisa Stewart in St. Anthony’s & Claddagh Credit Union on 091 537 200.